GS1 blog series: why Web-enable GS1 identifiers? Last week, we kicked off our GS1 blog series on and the IoT with a ‘beginners guide’. Here we’re going to address some key questions we’ve had from brand owners and retailers about what ‘web-enabling’ GS1 identifiers actually means to them. The answer is that brands can provide their own product information through web standards. In communicating directly to consumers via the physical product, they can avoid disintermediation and can control the messaging about their products so it’s consistent and aligned with their brand. While this may sound complex, brands actually already have everything they need to start the execution. GS1 identifiers are already the primary global product identification standard and are in broad use throughout supply chains and products. Internet of Things technologies and communication standards help the digital economy move faster than it ever has before. Combine those two things with the scalable platform from EVRYTHNG, and brands now have the foundation for a digital transformation strategy. Products are typically born analog, and don’t live connected lives like people or devices. They may have a Global Trade Item Number (GTIN), a unique numbering sequence, encoded in a data carrier that is often attached to them through a barcode at manufacturing facility that is identified with a Global Location Number (GLN). They can then be shipped off through the distribution network with various Serial Shipping Container Codes (SSCC), passing through many different distributors and distribution center locations identified with more GLNs. Finally, they arrive at the store (with yet another GLN) and are purchased by consumers enabled by the GTIN encoded in the data carrier attached at the beginning of the journey. Products and their associated data change hands multiple times, resulting in unintended transformations or outright data loss. Brands may often be stuck playing “telephone” trying to make head or tail of the full supply chain and the product data itself even though their identifiers have been consistent the whole journey. There are point-to-point solutions that address pieces of the data supply chain along the way, but most don’t easily unify or share data. 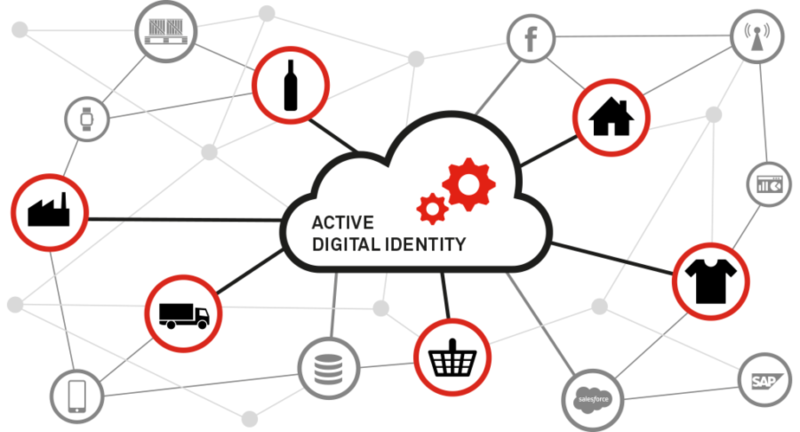 However, if the identity of the product was digitally enabled as a web resource, using the Web of Things model, following physical products through their entire journey and layering on value-added data with each stop could be possible. This would give brands complete transparency in their supply chains and distribution networks, which means they can optimize, evaluate and react to events as they happen in near-real time. Figure 1: A product with an Active Digital Identity on the EVRYTHNG platform can interact over the Web, making it linkable, discoverable, searchable and usable. It doesn’t stop there. When GTINs are web-enabled, consumers can more easily engage with them since brand-provided product information is made more available, and brands now completely control the experience. It’s not about someone looking up potentially inaccurate product information scraped from the web by a random product information app, but going to the expert that knows the most about your product: you. We’ve only just waded into the shallow end at this point. Next week, we’ll explore using GS1 Identifiers & SmartSearch with EVRYTHNG’s IoT Smart Products Platform.